Oh hey there internet, I'm back! Last night I went to a late holiday party with my old coworkers. It was so nice to catch up, drink wine and share food with each other. 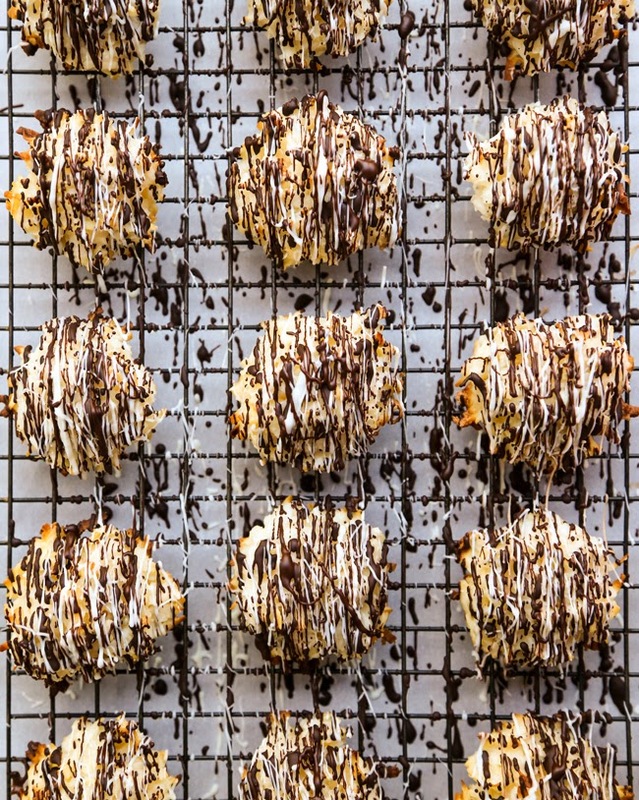 I went the sweet route and made coconut macaroons drizzled with plenty of white and dark chocolate. Aren't they pretty? 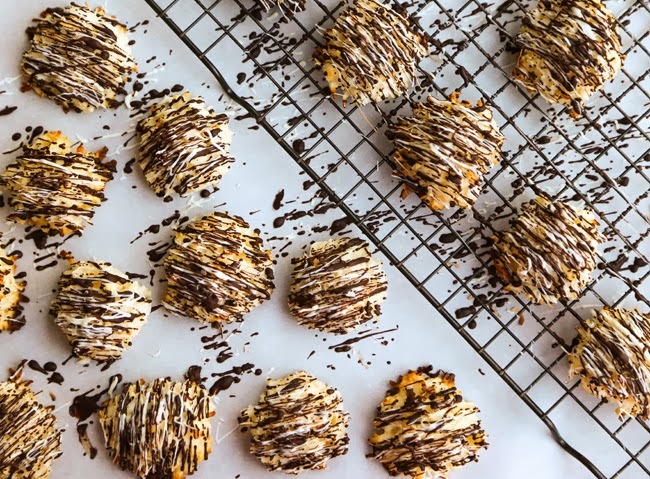 Macaroons are a great cookie to have in your arsenal because they are super easy and look so cute. In fact, they are so simple that for my 10th grade Spanish class final, I demonstrated how to make them (in Spanish of course) to the class. So friends, if I can get up in front of thirty 10th grade jerks and wing a cooking class for macaroons in Spanish, you can whip them up. This is not me bragging. 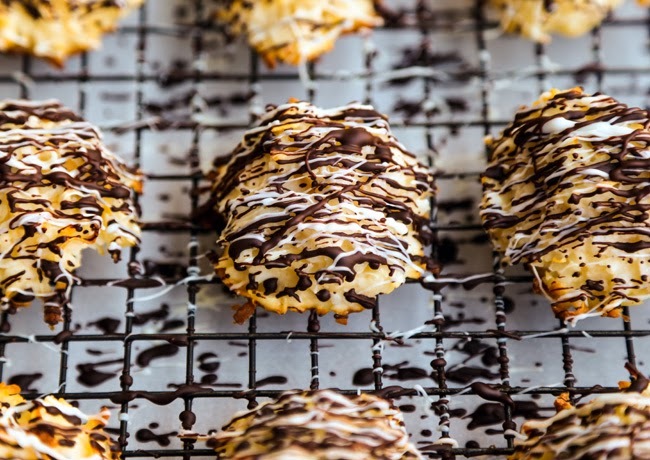 I chose this recipe to present because the cookie (minus the fancy chocolate drizzle) consists of four ingredients. Also, the Spanish word for "coconut" is "coco." It was an easy one to remember and say. Win win. While many coconut macaroons don't call for cake flour, I like my coconut macaroons dense. I also find a little flour helps to bind them. I have made them without before as well, but what can I say? I like a solid, heavy macaroon. 1. Preheat oven to 350, and line a cookie sheet with parchment paper. 2. In a mixer, combine coconut, sweetened condensed milk and vanilla. In a separate bowl, whisk room temperature egg white until they form stiff peaks. 3. Fold egg whites into coconut mixture. Sift cake flour onto coconut mixture and mix gently to combine. 4. Form mixture into balls about 1 tbs big and place on lined cookie sheet. I found that scooping them out with the tablespoon then forming them a bit with wet hands worked best. 5. Place in oven for 15-17 minutes, or until the top starts to turn slightly golden brown. Let cool thoroughly. Once all your cookies are done, time to melt some chocolate! I melted my chocolate chips over a double boiler. 1. Place a heat safe bowl over a small saucepan filled with a inch or so of water. Turn water on medium heat. Once water has begun to steam and heat up the boil, add dark chocolate. Allow chocolate to melt, stirring frequently. 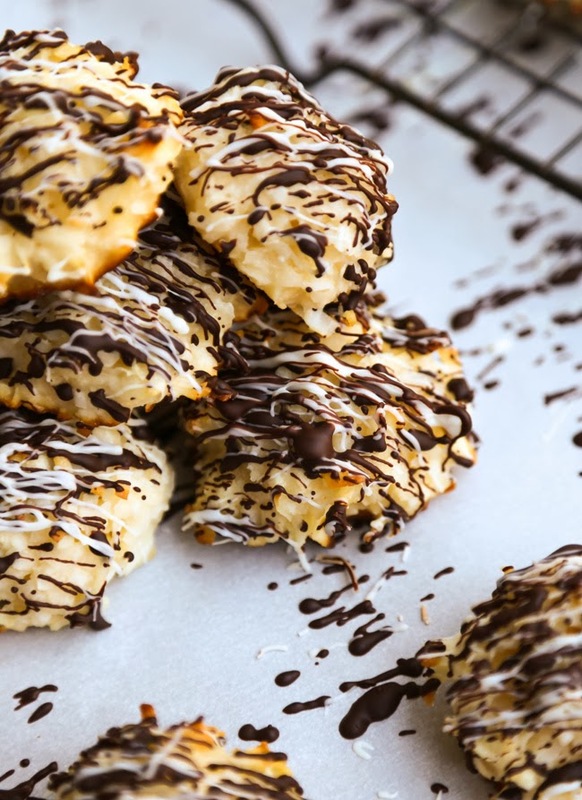 Remove from heat and use a spoon to quickly drizzle chocolate on top. 2. Repeat with white chocolate and allow to fully cool. You can place them in the fridge if you're impatient :) Then, enjoy!